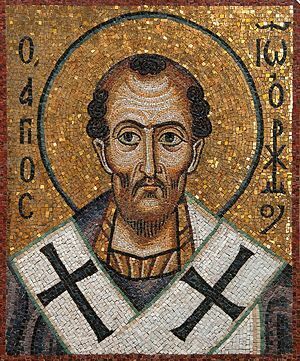 John Chrysostom (golden-mouthed), c349 – 407, Archbishop of Constantinople, known for his preaching and public speaking and his denunciation of abuse of authority by both ecclesiastical and political leaders. In 398, he was elevated to the See of Constantinople and became one of the greatest lights of the Church. He had enemies in high places. The empress Eudoxia, offended by the freedom of his discourses, sent into exile. In the midst of his sufferings he found the greatest peace and happiness. His enemies were not satisfied with his sufferings and banished him to the very extremity of the Empire. He died on his way there in 407.